Chest congestion occurs with different underlying causes related to respiratory diseases. Most often it has been seen with cold cough, infection in upper respiratory tract, allergic conditions, and smoking. Even with GI tract disturbance like GERD and cardiovascular problem like hypertension also provide chest congestion like symptoms. Antibiotics such as amoxicillin, azithromycin, clarithromycin, doxycycline etc. are a more preferable choice. Mucolytic agents are also prescribed, as they are capable to liquefy mucus and enhance excretion of mucous. Decongestants help to open the clogging of the nasal pathway and increase the mucosal secretion. Phenylephrine and oxymetazoline is used as decongestant. Water helps to hydrate internal system and prevent thickening of the mucus. Preferably lukewarm water intake maintains the fluidity of the mucous, specifically in case of cold and cough. Liquidation of mucous helps to easy removal of mucous from respiratory tract. Steam inhalation is an effective way to liquidation of mucous which stuck in the chest cavity. For this take steam inhaler and filled water and put on the switch. Warm stem should take via the nasal route. For soothing effect, add some menthol in water and inhale the steam. One of the most significant actions of black seed is against dust allergens. The anti-histaminic property provides these beneficial effects. Black seeds stabilize the mast cells and regulate the secretion of histamine (allergy-mediating substance) and it also blocks the histamine receptors. This can manage the associated symptoms like sneezing, coughing, blocked nose, runny nose, itchy nose, and bronchial inflammation. Apart from childhood allergic diseases like childhood asthma, it is also beneficial for allergic rhinitis. For application, boil black seeds with mustard oil for a few minutes, and then massage the warm oil in chest, nose and back. For effective result, it is recommended to prepare this freshly. Green tea helps to stabilize the mast cell as it contains high amount of quercetin (a type of flavonol). It controls the histamine release by stabilizing the mast cells and act as an anti- allergic. 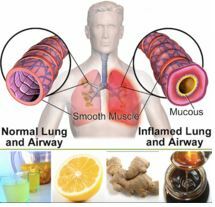 Drinking as well as inhalation of herbal tea preparation also gives symptomatic relieve from chest congestion. For preparation of herbal tea, add green tea and peppermint leaves with water and boil for 10 minutes. Then take this preparation in a Neti pot and inhale the vapor, which will definitely liquefy the congested mucus and easily excrete them and help to clear the mucosal congestion. All the citrus fruits including lemon, orange are the prime source of vitamin C, which give prevention against congestion of the chest due to mucus accumulation and also boosts the immunity. Essential oils present in the lemon are beneficial to control the seasonal asthma attacks. The symptoms associated with allergy can be eradicated by inhaling the essential oils of peppermint, eucalyptus and lemon. Garlic can block the histamine receptors and it also reduces the secretion of histamine from mast cells. Garlic has a natural antibiotic property which helps in cold and cough.